Looks like another shot has been fired in the simmering Coil Gun Control War. This time, [Great Scott] is taken to the discrete woodshed with a simplified and improved control circuit using a single CMOS chip and a few transistors. Where will it end? Won’t somebody think of the children? The latest salvo is in response to [GreatScott]’s attempt to control a DIY coil gun with discrete logic, which in turn was a response to comments that he took the easy way out and used an Arduino in the original build. [Great Scott]’s second build was intended to justify the original design choice, and seemed to do a good job of explaining how much easier and better the build was with a microcontroller. Case closed, right? Nope. Embedded designer [fede.tft] wasn’t sure the design was even close to optimized, so he got to work — on his vacation, no less!’ He trimmed the component count down to a single CMOS chip (a quad Schmitt trigger NAND), a couple of switching transistors, the MOSFETs that drive the coils, and a few passives. The NANDs are set up as flip-flops that are triggered and reset by the projectile sensors, which are implemented as hardwired AND gates. The total component count is actually less than the support components on the original Arduino build, and [fede.tft] goes so far as to offer ideas for an alternative that does away with the switching transistors. Even though [fede.tft] admits that [GreatScott] has him beat since he actually built both his circuits, hats off to him for showing us what can likely be accomplished with just a few components. We’d like to see someone implement this design, and see just how simple it can get. In this review we examine the three digit counter module kit from Altronics. The purpose of this kit is to allow you to … count things. You feed it a pulse, which it counts on the rising edge of the signal. You can have it count up or down, and each kit includes three digits. You can add more digits, in groups of three with a maximum of thirty digits. Plus it’s based on simple digital electronics (no microcontrollers here) so there’s some learning afoot as well. Designed by Graham Cattley the kit was first described in the now-defunct (thanks Graham) January 1998 issue of Electronics Australia magazine. Now it’s time to work with the third control board. This one looks after the one’s column and also a few features of the board. Several functions such as display blanking, latch (freeze the display while still counting) and gate (start or stop counting) can be controlled and require resistors fitted to this board which are detailed in the instructions. Each digit is driven by a common IC pairing – the 4029 (data sheet) is a presettable up/down counter with a BCD (binary-coded decimal) output which feeds a 4511 (data sheet) that converts the BCD signal into outputs for a 7-segment LED display. You can count at any readable speed, and I threw a 2 kHz square-wave at the counter and it didn’t miss a beat. By default the units count upwards, however by setting one pin on the board LOW you can count downwards. Using the counters is a simple matter of connecting power, the signal to count and deciding upon display blanking and the direction of counting. Here’s a quick video of counting up, and here it is counting back down. This is a neat kit that can be used to count pulses from almost anything. Although some care needs to be taken when soldering, this isn’t anything that cannot be overcome without a little patience and diligence. So if you need to count something, get one ore more of these kits from Altronics. Full-sized images are available on flickr. And while you’re here – are you interested in Arduino? Check out my new book “Arduino Workshop” from No Starch Press – also shortly available from Altronics. The post Kit Review – Altronics 3 Digit Counter Module appeared first on tronixstuff. Today we conclude the series of articles on the resistor. You may also enjoy part one and two. With regards to this article, it is only concerned with direct current (DC) circuits. The IC in this example has two inputs, A and B. The IC sets D high if input A is high (5V), and low if A is low (0V). The designer has placed a button (SW1) to act as the control of input A. 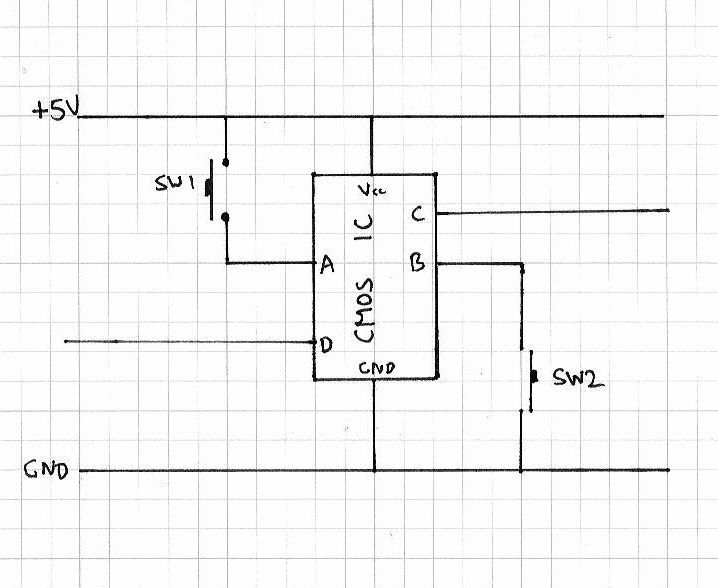 Also, the IC sets C high if input B is low (0V) or low if it is high (5V). So again, the designer has placed another button (SW2) to act as the control of input B, when SW2 is pressed, B will be low. However when the designer breadboarded the circuit, the IC was behaving strangely. When they pressed a button, the correct outputs were set, but when they didn’t press the buttons, the IC didn’t behave at all. What was going on? After a cup of tea and a think, the designer realised – “Ah, for input A, high is 5V via the button, but what voltage does the IC receive when A is low? … and vice-versa for input B”. As the inputs were not connected to anything when the buttons were open, they were susceptible to all sorts of interference, with random results. I (current) = 5 (volts) / 10000 (ohms) = 0.0005 A, or half a milliamp. As power dissipated (watts) = voltage x current, power equals 0.0025 watts, easily handled by a common 1/4 watt resistor. Our resistor R1 is called a pull-down resistor as it pulls the voltage at input A down to zero volts. 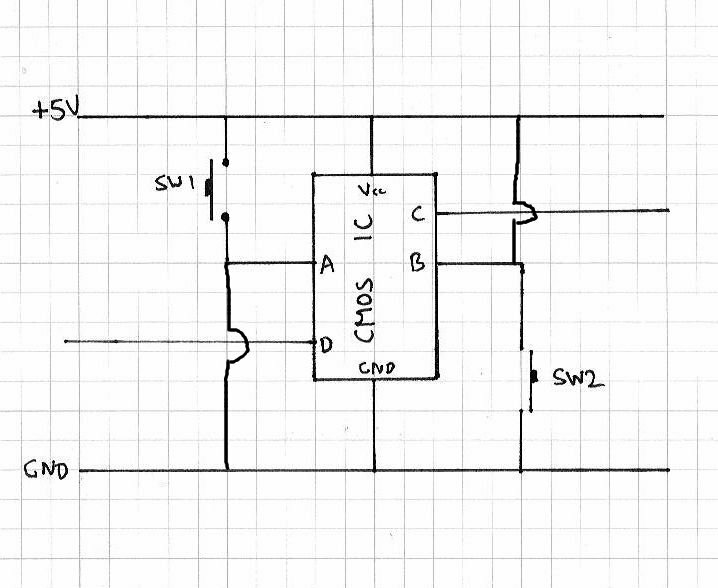 And with R2, when SW2 is open, input B is connected directly to 5V via R2. However. as the IC inputs are high impedance, the voltage at input B will still be 5V (perfect). When SW2 is closed, input B will be set to zero volts, via the direct connection to ground. Again, some current will flow through the resistor R2, in the same way as R1. 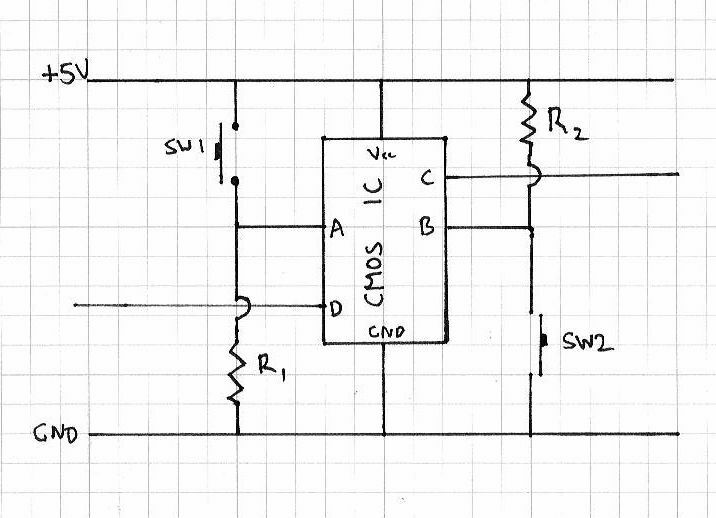 However, in this situation, we call R2 a pull-up resistor, as it pulls the voltage at input B up to 5V. Generally 10k ohm resistors are the norm with CMOS digital circuits like the ones above, so you should always have a good stock of them. If you are using TTL ICs, inputs should still not be left floating, use a pull-up resistor of 10k ohm as well. Pull-up resistors can also be used in other situations, such as maintaining voltages on data bus lines, such as the I2C bus (as used in our Arduino clock tutorials). So that is the resistor. I hope you understood and can apply what we have discussed. If you feel something is missing, or would like further explanations, please ask. As always, thank you for reading and I look forward to your comments and so on. Furthermore, don’t be shy in pointing out errors or places that could use improvement. Please subscribe using one of the methods at the top-right of this web page to receive updates on new posts. Or join our new Google Group. Otherwise, have fun, be good to each other – and make something! You are currently browsing the archives for the CMOS category.